Foreo Luna Mini vs Solo Mio, Which One to Get? Two of the most popular silicone facial brushes today are the Foreo Luna and the Solo Mio. We’ve given you what you need to know about these devices separately, including a product review on them, so if you need to go over these reports once again, here are the links: Foreo Luna review and Solo Mio review. In this article, we’re giving you a product comparison between the Mini version of the Luna and the Solo Mio. With this comparison, we hope to help you answer this one ultimate question: Which one should you get? 2 Which One to Get? Shape. Expect a curved design for the Solo Mio, round-shaped design for the Foreo Luna Mini (see image below). Because of the curved design of the Mio, it helps reach narrow or hard-to-reach areas such as the sides of the nose. Price. The Solo Mio is cheaper than the Luna Mini. Waterproof. You can keep both of them in the shower without worrying about damages. Colors. The Solo Mio comes in only one color – pink. As for the Luna Mini, you can choose from 5 colors – cool gray, magenta, petal pink, purple, and turquoise blue. Speed. With the Solo Mio, you can choose from among 14 speed settings. For the Luna, expect 2 settings. To change the speed setting, the Solo Mio has “+” and “-” signs while with the Luna Mina, there’s only one button that you can repeatedly press to change your setting. Size. The Solo Mio (3.2 x 0.8 x 2.8 inches) and Luna Mini (3 x 1.1 x 3.2 inches) are comparable in size. They’re both small, and they fit and store easily. Charging Port. The Mio has a silicone stopper that covers the port when you’re not using it. Although the Luna Mini doesn’t have this feature, users say that even when the charging port gets wet, they haven’t experienced any issues with it. Silicone Touchpoints. Both brushes have two sections – in front are the “finer” silicones and at the back are the “rougher” bristles. However, when it comes to number, the Solo Mio has more silicone touchpoints than the Foreo Luna Mini. STOP! Before you choose, always be careful of fake products. Buy only from reputable sources. We echo what Nicole (video above) says. 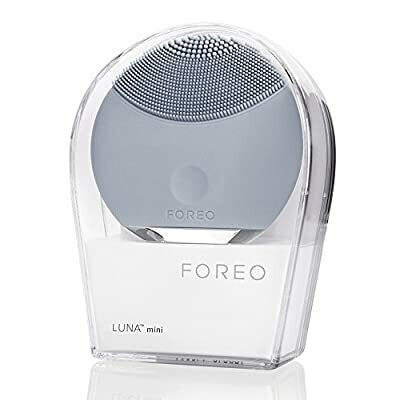 She says she feels like the products are “so similar you couldn’t even tell the difference if you were to slap a Foreo Luna on the Solo Mio.” Meaning, if you’re looking for a cheaper alternative to the Foreo Luna Mini that works like the Foreo Luna Mini, go for the Solo Mio.